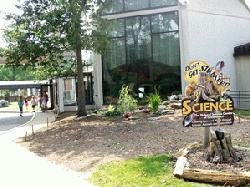 The Greensboro Science Center offers four fascinating attractions in one wild destination! It is the ONLY facility in the state to offer an accredited science museum, zoological park, OmniSphere Theater and aquarium all in one destination! Their Hands-On Science Museum allows guests to walk among ancient animals in the Dinosaur Gallery, explore the human body in HealthQuest, experience extreme weather, check out the reptiles in our Herpetarium and much more! Their younger visitors (ages 5 and younger) can explore Kids" Alley. Located inside the museum, our state-of-the-art OmniSphere Theater provides guests with a chance to see awe-inspiring digital shows in a 40ft dome theater! Full-dome and 3-D shows are offered daily. Evening laser shows are available once a month. Animal Discovery Zoological Park offers up-close encounters with many amazing animals including tigers, meerkats, monkeys, gibbons, tortoises, crocodiles, wallabies, maned wolves, a red panda and many more. The Friendly Farm petting zoo and Discovery House allow visitors to pet live animals such as goats and sheep. Keeper Talks are an opportunity to learn about zoo residents from the experts - our friendly and knowledgeable zookeepers! CAROLINA SCIQUARIUM Visit the Carolina SciQuarium, central North Carolina"s first aquarium featuring live sharks, penguins, fishing cats, stingrays and exotic fish. Greensboro residents receive $1 off general admission. Members of the military receive $1 off general admission with a valid military ID. College students receive $1 off general admission with a valid college ID. City of Greensboro employees receive $1 off general admission with a valid City ID. OmniSphere Theater ticket fees are in addition to General Admission. Evening Laser Shows: (no general admission required). OmniSphere Theater: Public shows are offered daily every hour from 12pm - 4pm.